The world is witnessing a major shift in the development of energy technologies, where energy productivity is produced on a large scale; innovation moves at a speedy pace, boosting economic growth and leading to improved sustainability. Even with many of the new disruptive technologies being familiar ones like unconventional gas, electric vehicles, solar & LED lighting, they will take many companies by surprise once they reach critical mass. Even with their development being monitored over the years, the nature of technological change proves to be far from predictable. The accelerating pace of energy innovation means that some technologies will achieve commercial viability much faster than many would expect. Technology may advance incrementally for long periods of time without substantially affecting established players and may remain uneconomical on average until such time when the new technology delivers a cost & performance ratio that is superior to existing ones. In this case, wide scale adoption will ensue, which will render traditional models of doing business invalid in a short span of time. History has shown us that disruptive innovations can cause dramatic increases in productivity, transforming industries and setting whole societies on new paths to growth and sustainability. An example of such disruption is the rise of wireless technology which has fundamentally changed the telecommunication industry. While smartphones, enabled by ever-smaller and faster chips, have revolutionized the consumer-electronics industry, energy markets are on the verge of a similarly dramatic transformation. Energy-technology innovators are taking advantage of developments in areas such as software and semiconductors to greatly improve how the world produces and consumes energy. To succeed, companies must understand the major performance thresholds for each technology and the market shifts where breakthroughs will trigger, as it is no longer sufficient to simply keep an eye on technological developments. Several technologies have the potential to begin to affect energy productivity of the future: unconventional natural gases, electric vehicles, advanced internal-combustion engines, solar, and LED lighting. 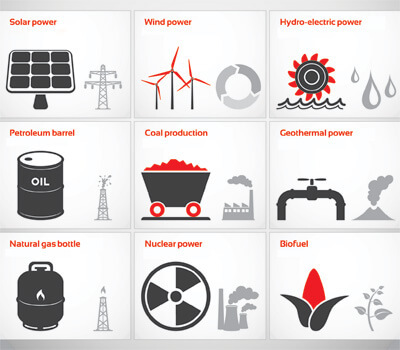 Others that would have impact after 2020: grid-scale storage, digital power conversion, clean coal, and biofuels. These technologies have broad applications, and they are mature enough to disrupt markets when their implementation costs drop below those of the conventional ones.